The appendix is a small pouch-like structure on located inside the abdomen in the lower right area. It’s positioned at the junction where the small intestine meets the large intestine. It is said to be a remnant of human evolution which has slowly reduced in size over centuries. Furthermore, no one seems to know the function of the appendix, but it thought that it has a function related to the immunity of the gastrointestinal tract. In medical terminology, the suffix “-itis” is always used to signify and inflammation or swelling of an organ. For example, arthritis which we commonly hear about is the swelling or inflammation of the joints in the body. Therefore, Appendicitis signifies the swelling of the appendix. Currently, appendicitis is diagnosed in 10 out of every 100,000 in the population. Without proper treatment, Appendicitis can be a fatal illness. Appendicitis is one of the more common surgical emergencies presenting to hospital nowadays. Although a specific cause as to why appendicitis occurs has still not been identified, it is believed that the illness occurs due to the blockage of the outlet of the appendix. As discussed before, the appendix is a sac-like organ with only one outlet. This outlet is open to our bowel. Now as we know, the bowel is teeming with bacteria. However, these bacteria are generally harmless and actually help is some processes related to digestion of food. When this opening of the appendix closes due to blockage, the bacteria on the inner lining of the appendix start to multiply, and with no way to exit the appendix, causes inflammation. This, in turn, causes the appendix to swell and you perceive it as an intense abdominal pain as any irritant process occurring in the abdomen causes pain. What are the signs that can tell me that I may have appendicitis? Appendicitis first starts with a sudden pain around the navel. Now, this may confuse some as we described the Appendix as an organ on the lower right side of the abdomen. This pain is called referred pain. This is due to the arrangement of nerves in our body. This pain gradually moves to the lower right side of the abdomen later. The right lower pain can occur without the pain around the navel as well. The site of the pain cannot be pinpointed to the right lower area of the abdomen in certain cases such as pregnancy, where the appendix is pushed upwards by the womb. The abdominal pain will be worsened with coughing, sneezing, walking or if you make any sudden movements. Associated with the pain, there will be a nauseated feeling and vomiting at times. With the loss of appetite and diarrhea or constipation. As this is an infection, it is very common to experience a low-grade fever as well. From a simple gastroenteritis to more sinister causes, abdominal pain can arise due to a multitude of causes. 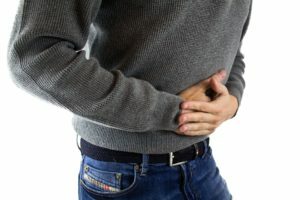 Though all abdominal pain may seem similar to us, each disease condition as unique features which help to distinguish one cause for abdominal pain from another. Your doctor is trained to identify these specific symptoms and arrive at a diagnosis. Therefore, it is extremely important that you visit your doctor if you have any sort of abdominal pain immediately. How does my doctor confirm that I have Appendicitis? Diagnosis of Appendicitis is mainly clinical. Which means that the doctor will be able to identify the condition based on the information provided during your interview with him and by performing some targeted physical examination techniques. Physical examination involves applying gentle pressure on the abdomen to see if there are any masses that the doctor can feel. Also, he may press on a certain point, withdraw his hand, and ask if the pain is more or less when he moves the hand away. The physical examination is not only targeted at confirming that it is appendicitis but also to rule out any other causes such as inflammation of the Gall Bladder. While there is no specific test to identify Appendicitis, certain tested may be ordered by your doctor to help him confirm his diagnosis. Full blood count, or complete blood count, CRP or ESR are blood tests which can be performed to see if there is an infection in your body. These are simple blood tests which can yield a wealth of information related to infections. These tests will not point out the appendix as the source of the infection but will give a clue to the doctor that there may be an infection spreading somewhere in the body. Imaging tests such as CT Scans can be performed to investigate but this is only performed when the diagnosis of appendicitis becomes doubtful. The 1st line treatment for appendicitis is the surgical removal of the appendix. However, before surgery is performed there are certain other medications which are given. Treatment of appendicitis requires hospital admission, where initially your pain will be relieved with either oral, rectal or intravenous pain medication. The medical team will also start you on antibiotics which will help combat the infection. A non-ruptured appendix can be removed through surgery. Since this organ does not perform any specific function, the removal will not cause any adversities to the body. This surgery can be performed by a small cut on the abdomen, but keyhole surgery has now become a more popular method of treatment. This accounts for faster recovery and more rapid healing. You must discuss the options available to you with your surgeon and come to an informed decision. If the appendix does rupture, it becomes covered by a structure called the peritoneum, which prevents the contents of this sac from leaking all over the abdomen. This slowly forms into a fluid-filled space known as an abscess. If this occurs, surgery is not done immediately, rather a drainage of this abscess is performed and you will be sent home with antibiotics and other medications. When the abscess settles the appendix will be removed at a later time. Appendicitis is a relatively simple disease to treat and diagnose. The main limiting factor is the delay in seeking treatment. Therefore it is important to remember that abdominal pain is not something that you can dismiss easily. It has to be investigated and treated appropriately.